A few days before CES I was browsing Amazon for my last minute travel items and randomly decided to pick up some NFC tags to use with my BlackBerry Bold 9900. What I was going to use them for exactly I wasn't quite sure, but I knew a bit about the NFCShortcuts (formerly NFCLauncher) app and figured if nothing else I could play around a bit. 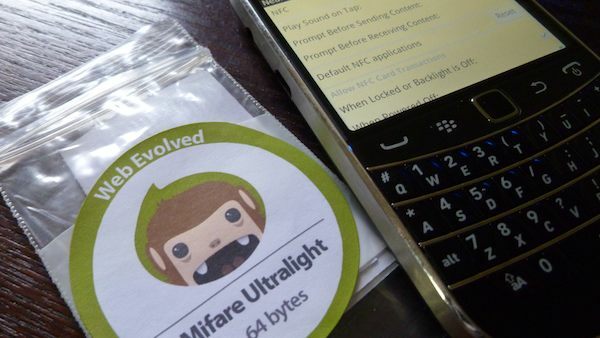 I picked up some Mifare Ultralight NFC Tags (pack of 10 tags for $15) and was on my way to NFC goodness. Unfortunately the tags didn't arrive before I left for my CES journey, but I did have plenty of time to play around over the weekend after I got back. Keep reading and we'll take a look at how these NFC tags work and just what you can use them for on your BlackBerry Smartphone. First off you may be asking yourself, what is NFC? We have a great post that explains in detail just what NFC is and why it matters to you. To get started you'll need a few things. Obviously you'll need a BlackBerry with NFC capabilities like the Bold 9900/9930 or Curve 9360 and some quality NFC tags. Then you'll have to pick up NFCShortctuts ($2.99 in BlackBerry App World) for basic tasks like launching apps, and if you want to get into it a bit more, ShortcutMe ($4.99 in BlackBerry App World) for some extended functionality. Now once you have everything you need, the steps to get up and running are really dead simple. First off you'll have to wipe the Smart Tag data from the NFC tag you want to use (this keeps any pre-programmed URLs etc. from popping up when you scan a tag). You can do this using the Write to Tag option in the NFCShortcuts app (just be sure not to lock the tag after writing). From here you have a clean tag to play around with. Choose Add a New Tag in NFCShortcuts, then scan your empty tag. From this menu you can choose the action to take when the tag is scanned. The list here shows all the apps on your device and you can choose to launch one when the tag is scanned. Choose an app and you're set. Now exit NFCShortcuts and scan the tag -- you'll be taken to the app you chose in the last step. Pretty sweet huh? Make sure you have your NFC settings the way you want them to. Go to Options > Network and Connections > Near Field Communication to tweak as needed. Now if you're like me you'll realize that simply launching an app with an NFC tag gets pretty boring after a while. If you want something more, you can get really carried away by combining NFCShortcuts with ShortcutMe on your Blackberry. ShortcutMe has been around for quite some time and is essentially a shortcut app for your device, but when putting it together with the power of NFC, it allows you to do pretty much anything -- including changing profiles, toggle Bluetooth & Wifi, send a text message, make a phone call, launch an app, turn on your flashlight, set your alarm ... the list goes on and on. So do I recommend having the app? If you plan on going NFC crazy, then yes. From here you'll have to decide just what you want to do when you scan that NFC tag. Do you want to scan a tag in your car to enable Bluetooth? Scan a tag by your office door to send your spouse a text saying you're on the way home? Have a tag on your nightstand to turn on your flashlight? The possibilities are really only limited by your needs and imagination. To perform any of these tasks, you just need to setup a shortcut within ShortcutMe. It's all pretty straight forward here as many of the shortcuts are preloaded in the app, but if you're techy enough you can play around with macros and all of the other fun stuff that ShortcutMe offers. Depending on what you want to accomplish, you'll most likely have to create some custom shortcuts (with much trial and error) to ultimately get the job done. This one is super simple and pretty practical for me. I've set a tag on my nightstand that, when scanned, turns on the flashlight on my 9900 (flashlight meaning video camera flash). I do this by combining a preloaded command in ShortcutMe with a tag in NFCShortcuts and presto! Flashlight on demand. Very simple. Perhaps my favorite NFC tag so far is the one I have at the front door of my house. A while back I installed a full Schalge LiNK (now Nexia) system in my house that includes camera, a thermostat, light modules and best of all a keypad lever for my door. This system has a BlackBerry app available that allows you to control everything in your house - including the front door. So what better way to use NFC than to unlock my door for me? Now while this method isn't perfect, it definitely is geeky enough to make me smirk (and for my friends to think I'm nuts). Getting this done requires a hefty macro shortcut in ShortcutMe which opens my Nexia app, puts in my pass code, navigates to the door tab in the app and enters the unlock command. If all goes well (and my network isn't boggy) then my door unlocks in a few seconds (and by "a few seconds" I mean anywhere from 5 to 30 depending on what kind of mood my device is in). Sure, there are locks intended for this, but for the purposes of BlackBerry, NFC and just plain old fun, this one suits me just fine. We actually came across some sweet locks from Yale that look to incorporate NFC in the near future and I can only hope that Schalge chooses to do the same. So as you can imagine, there are tons of ways you can choose to use NFC with your BlackBerry. Many users think that having NFC on their device is just a bonus they can put to use down the road, but the truth is, you can grab yourself some NFC tags right now and start using NFC on your BlackBerry. The tags aren't expensive and the apps won't set you back much either -- so to get up and running all together will cost you less than $25. The examples I have here are really basic and given some time and effort, you can go wild with all kinds of things using NFC. Start your media player, take a screenshot, make a phone call, send a tweet ... you name it. If you give any of this a shot, be sure to leave a comment letting us know how you're putting NFC to use (I need more ideas!!). Near Field Communication - what is it and why should I care?